Marco Fu is through to his first Masters final after a terrific fightback this afternoon to deny Mark Allen that long-awaited maiden final appearance. Both players started the day well, a run of 70 from Mark giving him the opening frame before Marco hit back immediately with 82 to level at 1-1. From there however the match appeared to be going the way of the man from Antrim, Allen taking the next two to lead 3-1 at the break before he added what appeared as though it might be a decisive fifth frame, coming back from behind to leave Fu kicking himself. At the time I posed the question on Twitter as to whether this frame might be decisive, but this could not have been further from the truth as Marco then responded in marvellous fashion, breaks of 136, 97 and 130 putting him level before he took a scrappy ninth frame to lead for the first time at 5-4. Mark had a chance during frame ten to force a decider following a missed green from Marco but by now it was already apparent that it was not going to be his day and Marco duly wrapped up a marvellous comeback which you could not see coming at 4-1. Mark had his chances, a kick in frame six proving particularly bothersome, but in general could do little against a player scoring as heavily as Marco did from 4-1 down. That said, it is another defeat in a major semi-final for Allen and I just wonder if this trend is becoming something of a monkey on his back now. Hats off to Marco though, a tremendous performance and one that underlines his return to form this season, despite his fall in ranking which comes largely due to results from 2009/10. 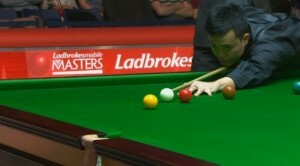 Yes he can, he beat Ding in the asian games final. who probably has better nerves. There will be several tons and pure classic propaganda snooker. Allen is suffering badly from semifinalitis. How he failed to close the deal I will never know. I hope he won’t suffer mentally from all these trophy fata morganas. Better luck next time Mark.